Babies born with deformities in West Africa start life as victims of the West African superstition that abnormalities are signs of a curse. When Barbara was born with a cleft lip that extended up into her nasal cavity, her father pronounced that she was a “demon child.” He ordered his wife to take the tiny infant into the bush and leave her for dead. Barbara’s brave mother, Aminata, refused to abandon her child. As a result, she was thrown out of her house and moved in with her sister. Without a way to support her family, Aminata was forced to separate her four other children and send them to the homes of other relatives. By the time she was eight months old, Barbara’s weight was drastically low because her cleft lip prevented her from getting the nutrition she so desperately needed. In fact she weighed less than 4 kilograms (8.4 pounds), less than half of what a thriving baby her age should weigh. To make matters worse, she had contracted tuberculosis and was placed on a TB program at a local hospital. Of course, the lack of financial support since the abandonment by the baby’s father was another serious obstacle. Broken and devastated, Aminata had reached her darkest, lowest point. Then God stepped in and brought a ray of light. One day Aminata met a woman who said that Barbara was not a “demon child.” She also said that Mercy Ships would arrive in Sierra Leone in just a few weeks. 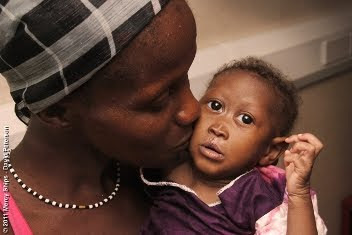 Volunteer surgeons onboard the Africa Mercy could fix the baby’s lip – for free! Desperately clinging to this fragment of hope, Aminata took Barbara to a Mercy Ships medical screening. Aminata was delighted when Barbara was accepted for cleft surgery onboard the Africa Mercy. However, because the baby was below the acceptable weight for surgery, she was placed on the Infant Feeding Program. 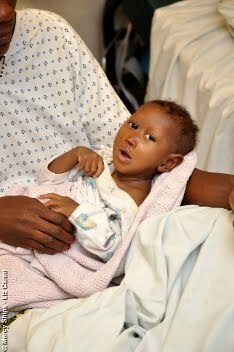 This program provided proper nutrition for the infant and instructed Aminata in a better feeding method. Barbara’s weight gain was monitored each week. The baby girl gained weight the first week she was on the program, but lost weight during the second week. She developed a fever, and she struggled to breathe or keep her formula down. The nurses gave her nasal drops to open her nasal passages, allowing her to breathe more easily. The third week she regained some, but not all, of the lost weight. It was beginning to look like Barbara was not going to be able to have her surgery. The doctors suspected she might have a cardiac problem, too, which would interfere with plans for cleft surgery. Those working with the program began praying regularly for Barbara, and slowly she began to gain the required weight. At the end of three months, despite all her problems, Barbara was cleared for surgery.